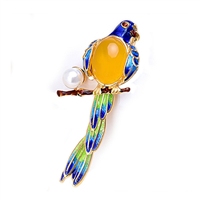 Cloisonne Enamel Jewelry Fashion Bird Brooch For Women. The enamel bird brooch can be made of environmental protection copper or 925 sterling silver. Its painted with cloisonne enamel. Very bright, colorful, and shiny design for women.